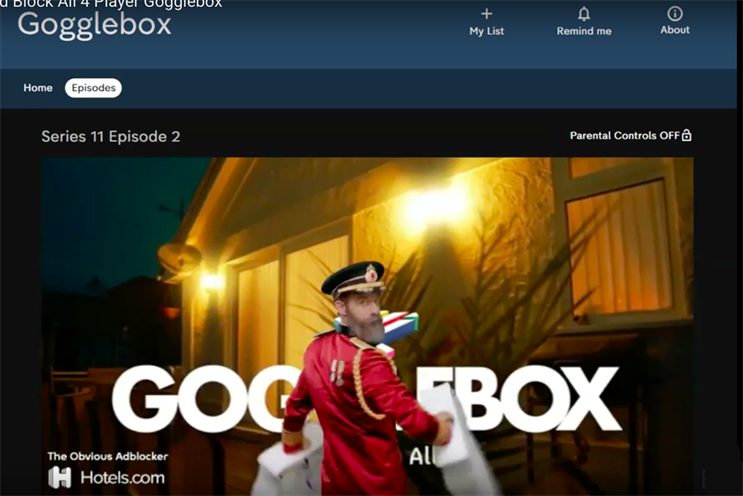 Channel 4, Crispin Porter + Bogusky and m/SIX have teamed up to create an interactive digital campaign that will see the Hotels.com brand's mascot, Captain Obvious, blocking ads on All 4. All 4 viewers served the latest Hotels.com ads will be given the option to ‘block’ them and when doing so will see Captain Obvious physically obstructing the advert, with the help of props including dry ice and giant foam hands, until the ad has played in full. Taking the ad-blocking riff one step further, the campaign will also see the character ‘blocking’ Channel 4’s own ads promoting popular series Peep Show, Misfits and Gogglebox. Video technology company Innovid developed the tech used in this campaign for All 4. "After quite literally live streaming a stream (of water) and ‘skipping’ an ad (by skipping throughout), Captain Obvious has taken his inimitable style to adblocking - with exactly the kind of results you might expect," Vincenzo Bruno, senior brand manager EMEA for Hotels.com brand said. "Partnering with Channel 4 once again has allowed us to be adventurous and innovative, creating content that encourages engagement over passive video views. It’s a fun spot of digital advertising and we hope that it gives All 4 viewers a smile, obviously." This ad exemplifies what smart creative ideas coupled with media-first execution can achieve, Tom Casswell, business director at m/SIX said. "The collaboration between Hotels.com, CP+B & m/SIX has been key in bringing this to life and after the success of Skip, we can’t wait to see how the audience reacts."